You don't have to be a doctor to know that eating hundreds of strips of bacon at a time can't possibly be good for your health. A reporter for Japan's Rocket News 24 obviously didn't get that memo. 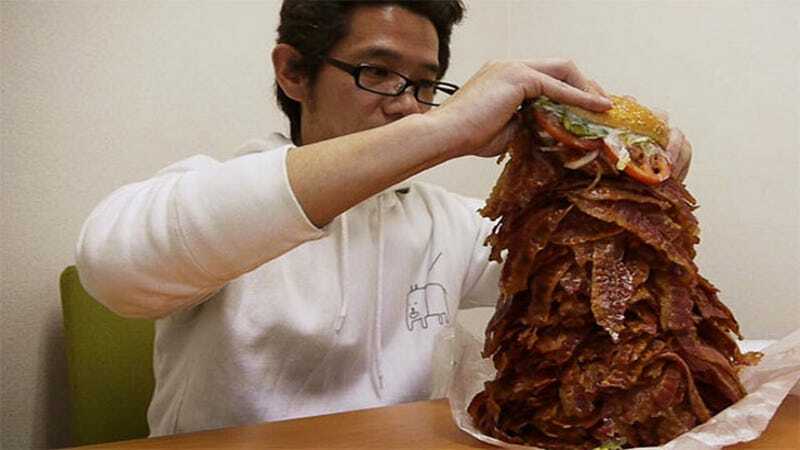 Because he ordered a burger from Burger King with 1,050 slices on top. You see, the fast food franchise is currently running a promotion that lets you tack on 15 strips of back for about $1.25 Or, in this case, over a thousand for about $90. The greasy, glistening burger must have been quite physically taxing because by the time he (spoiler alert) gave up, he was glowing with sweat and had only demolished about half of it. Then again, in this case, "half" is about five hundred slices of bacon.